As a subcontractor we offer our customers the best possible overall solutions. We have longstanding subcontractor relations with Finnish export companies. Our quality is certified according to the ISO 9001 standard. Österberg Ltd. is often involved in the customers development projects in the concept phase. By taking responsibility from the beginning we can effectively ensure a high quality throughout the manufacturing process. 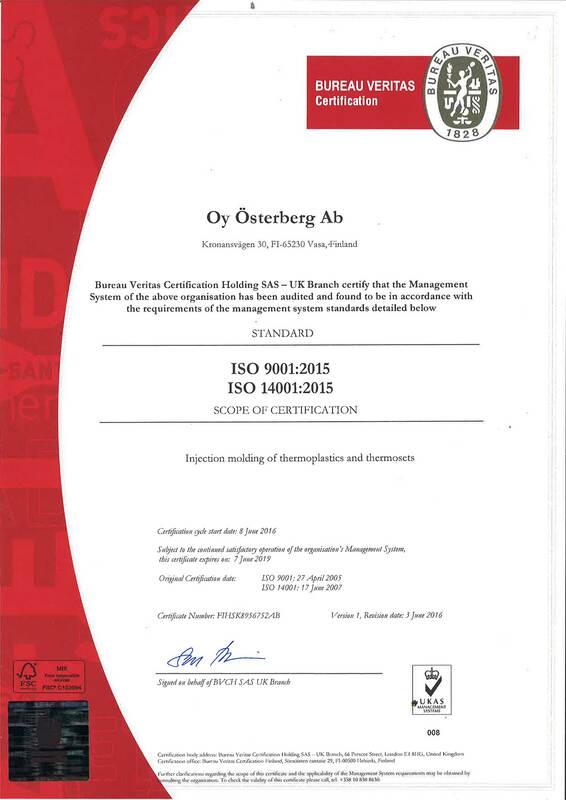 Österberg Ltd. is committed to an active environmental care and to adhering to the environmental requirements set on companies. We actively follow the set environmental standards in all situations where it is technically and financially possible. Our environmental principles are certified according to the ISO 14001 standard. molded plastic components in a way that satisfies, the customers, the company, the employees and society, and is committed to an active environmental care, as well as to adhering to the environmental standards required by the company. We actively follow the set environmental standards in all situations where it is technically and financially possible.